The 1980s opened with the recent completion of Gateway Mall and the expansion of the area’s largest shopping center, Kirkwood Mall. Dan’s Supervalu had opened its third location, next to Gateway Mall, in 1975. 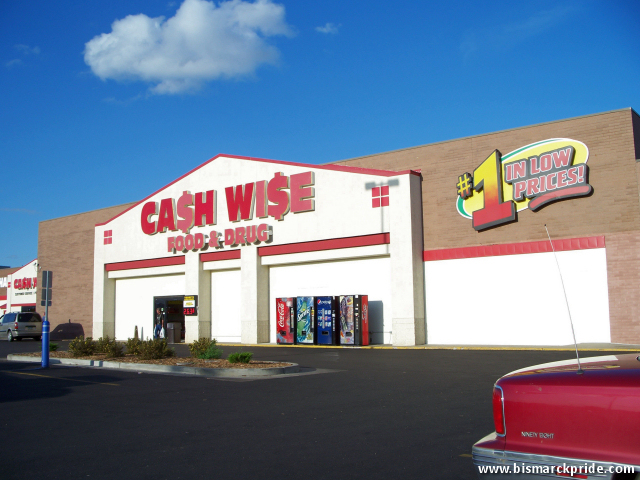 National catalogue retailer Best Products had opened a Bismarck showroom in 1979, and Cash Wise Foods opened adjacent to the new Best store shortly after, in 1982. This seemingly unstoppable retail growth would come to an abrupt end, and would remain stagnant for nearly two decades. About a year after the opening of Gateway Mall, anchor store A.W. Lucas closed after eighty years in business. The store was quickly replaced by Herberger’s, but the shopping center would see another anchor store depart in 1986, with the closure of White Mart. Menards moved into the former White Mart space, and despite that the new shopping center had already seen the departure of two anchor stores within six years, its future looked promising. Kirkwood Mall was not invulnerable to retail closures either. Woolworths, which was Bismarck’s first national retailer and the first store to open at Kirkwood, closed in 1985. Dayton’s Department Store then moved into the former Woolworth space. The State Heritage Center was completed in 1981, replacing the former museum that was housed inside the Liberty Memorial Building, which underwent major renovation immediately after. A big change in post-secondary education occurred when Mary College was granted full university status in 1986, at which time it began offering its first Master degree program. The Wachter Family sold Kirkwood Mall for a reported $40 million in 1984, but after a decade of fast-paced economic growth, greatly boosted from its real estate investments, the Wachters’ fortune took a sudden down-shift not longer after. Kirkwood Motor Inn, which opened in 1974 across from Kirkwood Mall, was foreclosed on in 1986. Paul C. Wachter was the hotel’s majority owner, and it proved to be only the first major downfall for the family. Kirkwood Motor Inn in-turn became Radisson Hotel following its foreclosure. It was one of four area hotels to face financial problems during the 1980s. Another hotel, Town House Inn, was foreclosed on in 1988 and ultimately became Kelly Inn. The Wachters took another blow in 1988 with the foreclosure of its 30,000-acre Wachter Ranch, located in southern Bismarck. Financial records released shortly after showed that Paul C. Wachter alone owed more than $30 million to lenders. 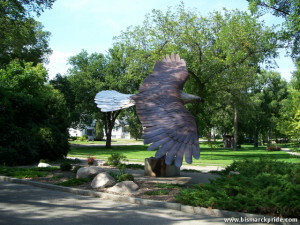 The Eagle Statue at Custer Park was dedicated in 1988. A beautiful new Eagle Statue was dedicated at Custer Park in 1988 to commemorate the bicentennial of the United States Constitution. That same year also saw the opening of Econofoods (now Central Market). Bismarck was put on the national map in 1989 when Capitol Lanes partnered with Midway Lanes to host the International Bowling Congress Tournament, drawing 44,000 bowlers to the area, doubling the size of the city during the event. Centennial Elementary opened in 1989. The same year, the Veteran’s Public Library completed major renovation. The 1990s began just as the decade had before, with a major retail development, Wal-Mart. Wal-Mart would be the only large-scale retail development that occurred during the 1990s, and just like the 1980s, major retail closures were ahead. In 1991, Wachter Junior High was the first school in North Dakota to convert to the middle school format. Simle Junior High also completed construction of a new south wing that year. Mort Bank opened a Rock N’ Roll themed McDonald’s on the former site of Auto Dine in 1992. Walmart and the recently completed Washington Street underpass sparked a significant building boom along the southern Washington Street corridor near Bismarck Expressway. Pier 1 Imports in 1992, Blockbuster Video and Little Caesar’s in 1993. The center anchor at Gateway Mall sat mostly empty between 1994-2004. Gateway Mall was particularly hit hard in 1994 when Herbergers left upon expanding its Kirkwood location. The anchor position Herbergers had occupied, which had previously been occupied by A.W. Lucas, was unable to hold a stable tenant until 2004 when Conlin’s Furniture moved into the space. Jacob’s Trading (later World’s Greatest Deals) did occupy the space for about two years. Menards also left Gateway at the end of the decade upon constructing their own store. Dan’s Supermarket opened a new store on Washington Street, replacing its Kirkwood location. 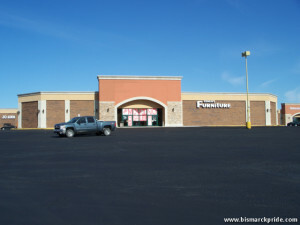 This was the first new Bismarck store for the company since the opening of its Gateway location twenty years before. It was also the first store in the chain to be officially branded “Supermarket” as opposed to Supervalu. TJMaxx and Rex TV & Appliance moved into the newly vacated former Dan’s Supervalu space next to Kirkwood Mall shortly after. National catalog retailer Best Products closed in 1997 following the company’s second bankruptcy. A bidding war among the three top office supply chains – Office Depot, Staples, and Office Max – commenced soon after to lease a portion of the former Best store. Office Depot proved victorious and occupied the space in 1998. 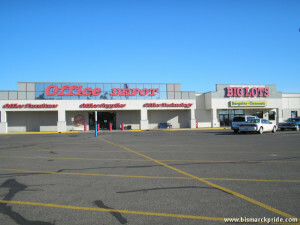 It was the first Office Depot in North Dakota. The eastern side of the former Best store remained empty until Big Lots occupied it in 2001. While Staples lost the space to Office Depot, the opening of its freestanding store on Washington Street preceded Office Depot by a few months. Kirkwood Mall could not dodge the bullet of closures, taking a severe blow when Montgomery Wards closed in 1998, almost seventy years to the date the retailer first arrived in Bismarck. Kirkwood Mall found similar difficulty filling its Wards space as Gateway did its Herbergers space, unable to permanently fill it until 2002 when I. Keating Furniture occupied the space. 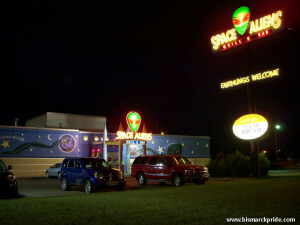 Space Aliens Grill & Bar opened in 1997. Two industries that did see substantial expansion in the 1990s were restaurants and hotels. Four hotels opened in 1996, and one in 1997. National chains like Applebee’s came during this decade, and also several local favorites, such as Space Aliens Grill & Bar in 1997. Space Aliens was founded by Mort Bank, who had previously established the McDonald’s Rock-N-Roll Cafe on Main Avenue in 1992. A second location was added in Fargo two years later. Today, there are six Space Aliens restaurants across North Dakota and Minnesota. The Winter Season of 1996-1997 had broken the record for the most snow received in a single season, with 101.6 inches. The Blizzard of April 1997 propelled the season into the top spot upon receiving 17 inches of snow. It was the worst single snow storm since March 1966. Two new golf courses, Hawktree and Pebble Creek, opened at the end of the decade in 1999. Pebble Creek is best known for the Fore Seasons Golf Dome.